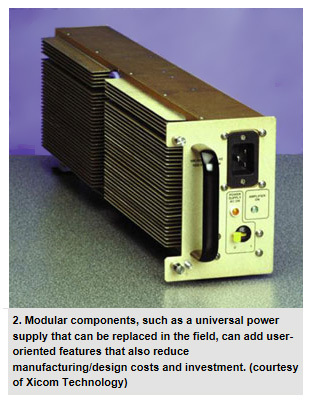 The following is an article written by Jean-Jacques DeLisle, Microwave and RF Technical Editor where Jon Jacocks (CEO) and Paulo Correa (Chief Technology Officer) are providing comments regarding new technologies, techniques and other factors that are influencing the evolution of High Power Solid State Amplifiers. RF/microwave power-amplifier systems traditionally have been chosen based on their SWaP-C characteristics. But recently, factors like intelligent features are being added to the mix. For military radar, test and measurement, and telecommunications applications, a full-featured RF/microwave power-amplifier (PA) system is necessary and critical in the design chain. 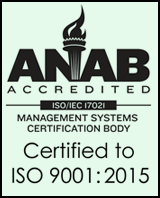 These systems often are driven by reliability, efficiency, size, and cost of installation. Understandably, the growth of the telecommunications industry has influenced the evolution of PA systems. To keep pace with the RF/microwave industry while providing better size, weight, power, and cost (SWaP-C) modular assembly techniques, engineers are increasingly leveraging intelligent system monitoring and the latest semiconductor technologies. To reduce size and increase power efficiency at higher frequencies, for example, gallium-nitride (GaN) PA technology is being readily adopted by the industry. 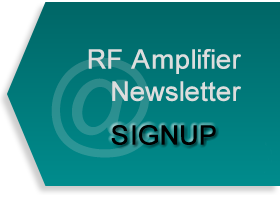 "For broadband scenarios with higher than 1-GHz frequency requirements, implementing an amplifier using LDMOS (laterally diffused metal oxide semiconductor) is difficult," says Paulo Correa, chief technology officer of Empower RF. "Broadband LDMOS can be used below 1 GHz, whereas GaN (gallium nitride) for broadband becomes very attractive above 1 GHz. You do see LDMOS being used successfully in narrowband applications (e.g., wireless infrastructure, ISM [industrial, scientific, medical], etc.) at frequencies above 1 GHz." Most PA manufacturers have offerings in various different package technologies for GaN PAs, such as TriQuint, Cree, MACOM, Microsemi, RFHIC, RFMD, NXP, Toshiba, and Miteq. GaN devices are primarily used in systems that require large amounts of wideband power to high frequencies. To some extent, they have replaced more expensive gallium-arsenide (GaAs) FETs, although these legacy devices are still used in certain applications. In PA system design, the passive components surrounding the amplifier often can't handle the frequency performance, heat, or power of which GaN PAs are capable. This generally leads to significant design efforts to achieve the highest efficiencies and performance for a GaN-based PA system. "Attention to losses between the active devices and the output of the system are critical for providing clean RF power and maximizing efficiencies," says Correa. With the increased heat flux of GaN PAs, more consideration is being devoted to reducing the thermal resistance at a device/component level. The whole thermal stack has become a significant design problem, as the individual junction temperatures from the die to the system assembly can affect the amplifier's performance. "How fast you can extract the heat from the PA in your device is where you gain a competitive advantage, or not," says Correa. In cases where the wideband frequency range is lower, PAs based on LDMOS are still very common. This is predominantly due to the cost and proven technology factor. For certain satellite-communications (satcom) applications, TWT-based (traveling-wave-tube) amplifiers are still used. Here, several kilowatts of RF power are needed to 50 GHz, or Q-band, frequencies. Currently, the typologies of amplifier designs also are shifting. Class A and AB are still used with radar, test and measurement, and electronic-warfare (EW) applications. The linearity of a class A amplifier is often desired with these applications. Yet the balance required for gain, power, and efficiency could lead to an AB amplifier system being the best fit. For telecommunications, the efficiency boost of Doherty configurations has taken the foremost position. Here, the cost-per-bit considerations for mobile data have contributed to a price-driven market. Most GaN PA manufacturers provide Doherty-based PAs as a result of this trend. To avoid high costs and increase the available market of goods, techniques that utilize the commonalities between designs could lower the hands-on costs of PA systems. To reduce the manufacturing and design costs of building systems on a customized per-customer basis, platforming techniques have arisen in the industry (Fig. 1). 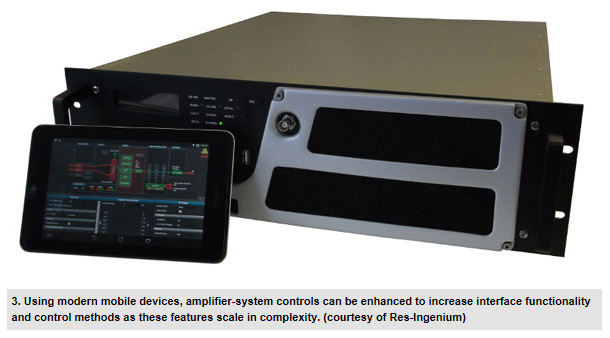 "The dollars per watt for most power amplifiers is the same value regardless," notes Jon Jacocks, president and CEO of Empower RF. "How you can achieve better costs is in volume production, reusing components in multiple designs, and reducing labor costs by making the design more manufacturable." For example, Xicom Technologies uses a universal and field-replaceable power supply in its rack-mount, solid-state PA (SSPA) products (Fig. 2). As has occurred in other areas of the RF/microwave industry, cost pressures have driven innovations in PA-system integration and assembly. PA system manufacturers are beginning to differentiate their products by using the same techniques developed by test and measurement manufacturers to reduce costs and increase functionality: trading wires for fixtures, using a standard chassis with modular packages, adding low-level sensor feedback, and including compact computers to add software features within an assembly. One example hails from RES-Ingenium, which includes an option with its 300-W DVB-T2 OEM broadcasting transmitter for a wireless interface that is compatible with a tablet. In addition, the software boasts many enhanced graphical-user-interface (GUI) options (Fig. 3). Component-level diagnostic and control features also are increasingly in demand (Fig. 4). These features are being integrated to leverage the computation-based control and optimization capability as more advanced computers are included within a PA system. "Our customers have an insatiable desire for data, and they want to drill down into the design. They want to monitor operational status down to a component level and isolate faults if something occurs," says Jacocks. Empower RF, for example, now offers a Web-based diagnostic and control-based system in its newest line of PA systems. "Doing that in a remote setting without having to physically remove your amplifier is of great interest to customers. You are fielding expensive systems, and they must be easy to operate and troubleshoot," Jacocks says. Built-in tests and enhanced stability controls also are building their capability to monitor PA system conditions and even correct for thermal and other drifting effects. When purchasing a complex and high-performing system, such as PA systems, more factors need to be considered beyond simple power, frequency, linearity, intermodulation distortion, and cost. Many other criteria may be present, such as efficiency, drift, size, and weight, depending upon the installation footprint. Thermal management, automation, control, and remote sensing may be high-value features for installations in harsh environments or remote conditions. In addition, the PA system configuration will be influenced by user expertise and the specific considerations for the devices with which the PA system will be interfacing. "Be clear on your specified requirements, how you have measured them, and under what conditions you will be operating," Jacocks recommends. As PA systems may excel in certain applications or fields, consulting with a manufacturer's technical experts also can be a critical part of the acquisition. "When you address your questions to the amplifier provider, try to understand the implications of the waveforms you will be transmitting and the tradeoffs with performance, efficiency, and bandwidth," Jacocks says.